We offer a 100% quality satisfaction guaranteed. Made from real Cherry hardwood veneer pressed to a solid core that enables them to be scribed in to uneven alcoves. Cherry floating shelves are clear spray lacquered 3 times and hand sanded between coats for a strong high quality finish. Custom made Cherry floating shelves can Support loads of up to 35kg to 50Kgs. Order a sample of the Cherry floating shelf finish here. 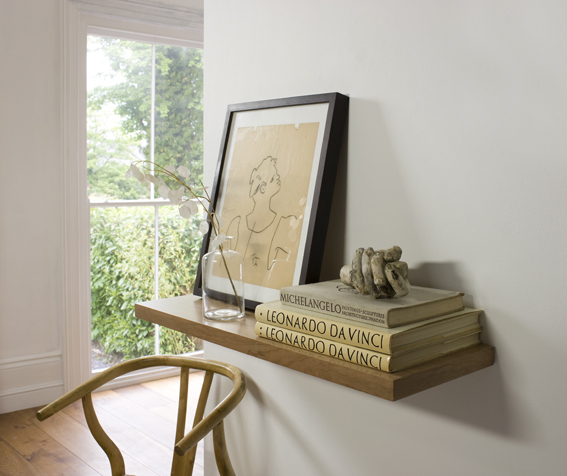 Cherry floating shelves are UK manufactured to your exact specification. Come with solid wall hidden shelf brackets and easy to follow instructions. Your choice of straight or rounded corners. Contact us for this option. Delivered between 14 and 21 days from date of purchase. Cherry shelves can support loads of up to 35kg to 50Kgs if using the Re-Bar system. Perfect shelves for alcoves and other hard to fit places. Cherry floating shelving supplied to London & the whole of the UK.